Almost everyone is aware that diamonds are expensive, but the term ‘expensive’ is rather vague and relative. So how do you check the price of a diamond, how do you get an answer to the question ‘what is my diamond worth’. Take the stone to a jeweler and make an attempt to sell it, how could you be sure that the jeweler is offering a fair price for your precious stone. There are an equal number of cases where, prospective diamond sellers would need help to quote a suitable price for their stone. To understand the logistics that influence the price of a diamond, we would inevitably end up tackling the 4Cs. The cut, clarity, carat (weight) and color of a diamond are important factors that determine the price of a diamond. An expert could inspect a diamond and determine the 4Cs with significant accuracy. A novice could struggle to differentiate between an authentic diamond and a factory made look-alike. If you have a diamond and know nothing about the 4Cs of the piece, a good beginning would be to get it certified at a reputed testing lab. This is worth the effort and costs because, the 4Cs will be defined with professional accuracy. The diamond certification will also give a clear verification of the authenticity of the stone. For a moment, let’s switch to being a prospective buyer – insisting on a diamond certificate from a known testing lab, will be a good move. This would clear two challenges the first would relate to the authenticity of the stone, the second would ensure that, the stone is not being graded higher than its 4Cs would suggest. While the 4Cs are elements that influence the price of a diamond, nothing is going to matter more than the market mechanism. The price of a diamond would also be determined by the logistics of demand and supply. Unfortunately this is something that is hard to guess or estimate. It is not uncommon for even professional diamond traders to wrongly determine this equation. GLITZKOIN the world’s first diamond blockchain to be promoted by a professional from the industry, has released the first version of its ‘Diamond Price Estimator’. This tool is one component of the DiaEx Diamond Exchange, a trading platform that is based on the state-of-the-art blockchain technology. The algorithm that forms the nerve center of the Diamond Price Estimator, crunches thousands of demand and supply records across the globe. Assessing supply and demand behavior in major diamond markets, the price estimate is generally provided with an accuracy of +/- 15%. The application of the estimator at this point of time is limited to white diamonds. So the next time you wish to know the price of a diamond or get an idea of its value and worth, head for the DiaEx based Diamond Price Estimator. The best thing is that it is free of cost and you, are not obligated to buy or sell your stone on the GLITZKOIN diamond exchange. Simply put, there is no reason why you should not, use the handy tool. Let’s summarize all that we have mentioned above in a nutshell. The 4Cs are the basic elements required to determine the value of a diamond. Having said that, the demand and supply factors will also influence the price of the stone. Certifying a diamond will provide a professional assessment of the 4Cs of a specific diamond, the certificate would also clearly specify whether the stone is natural or synthetic. A reliable diamond price estimator that provides an unbiased price estimate, would prove to be useful. 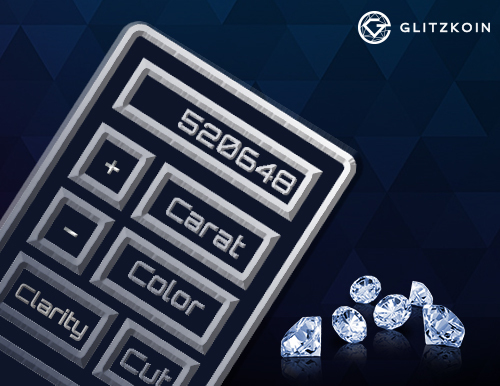 GLITZKOIN has released its Diamond Price Estimator as part of the DiaEx Diamond Exchange. You pay nothing for using the estimator and are not bound to trade on the Diamond Exchange.